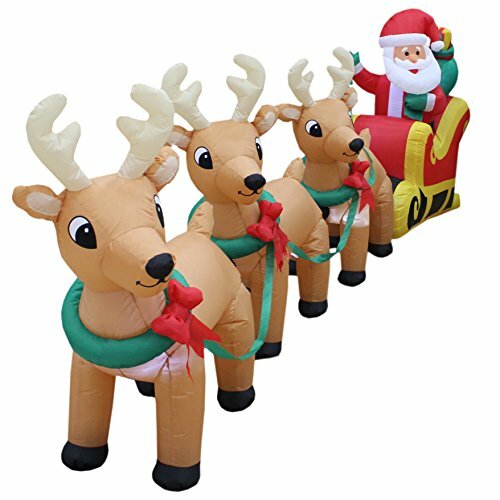 This 12 ft. long Inflatable Santa with 3 Reindeer is great fun that holiday guests, neighbors and passersby will enjoy. 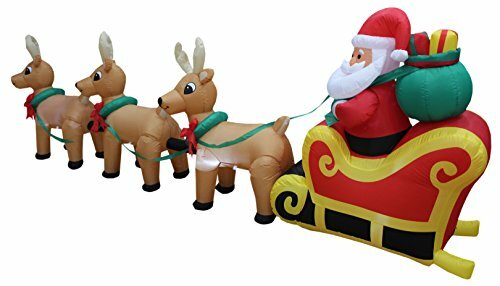 A giant 12 ft. in size for easy visibility, this inflatable self-inflates in seconds and lights up for day and nighttime enjoyment. Worried about storage? Simply let the air out and fold it! Caution: Do not inflate during storms or strong winds. Protect fan and power cord from water. Operation not recommended in temperatures below 14 degrees F (or -10 degrees C). Share the joy of the wonderful festival with GOT INFLATABLES. Please check out our other GOT INFLATABLES Halloween and Christmas Decorations!